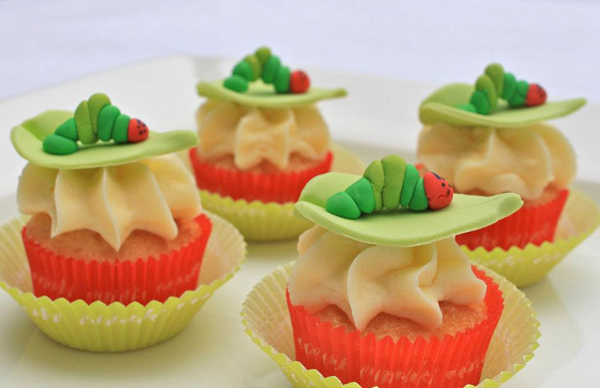 Ever watched a caterpillar as they go about their business wreaking havoc in the garden? They take a little nibble here, a little nibble there, and then move onto the next juicy tidbit. It’s the same for toddlers at a birthday celebration. 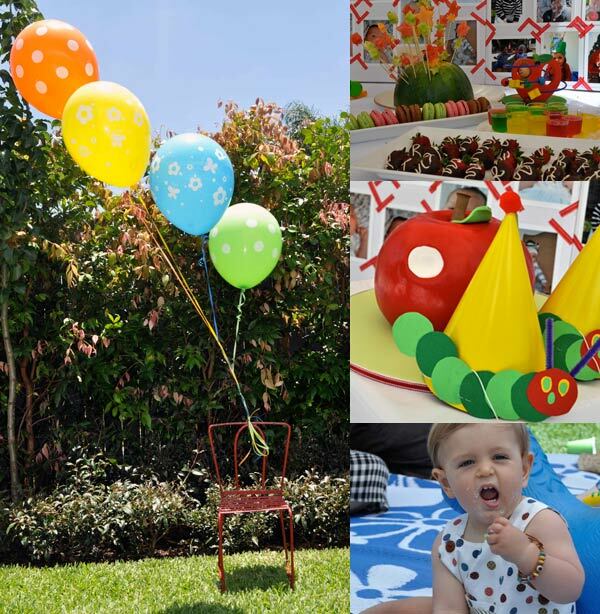 So a ‘The Very Hungry Caterpillar’ party makes perfect sense, when you think about it. It certainly did to Roberta when she was helping plan the first birthday celebration for her beloved grandson Rowan. Roberta is such a doting grandmother that she didn’t just offer to make a plate or two of fairy bread, she leapt right in at her daughter’s panicked cry for help and organised the whole thing! 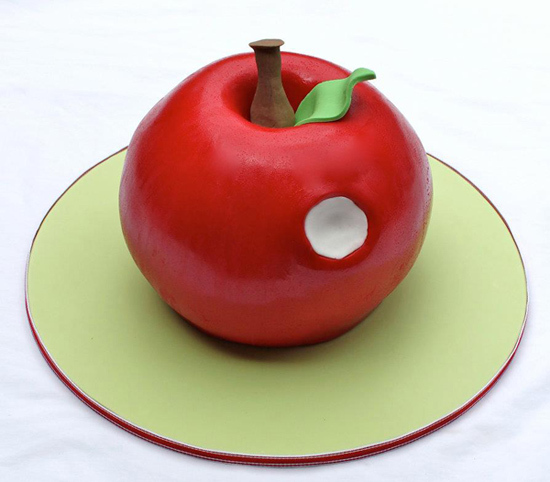 Roberta started by commissioning Bowral’s own fairy godmother of fondant, Alison Lawson, to create the cake, a most marvellous glossy red apple-shaped number that took pride of place on the dessert table. A white chocolate mudcake with white chocolate ganache, we understand the “caterpillars” didn’t leave so much as a crumb! Alison also made the cutesy caterpillar-and-buttercream-topped cupcakes (pictured top) and these amazing vanilla cookies, complete with their too-cute-for–words caterpillar hole cut-outs. We adore the way she decorated them to tell the familiar story, starting with one apple and two pears all the way to a slice of salami and an ice-cream cone! And just look at the clever sandwich idea! 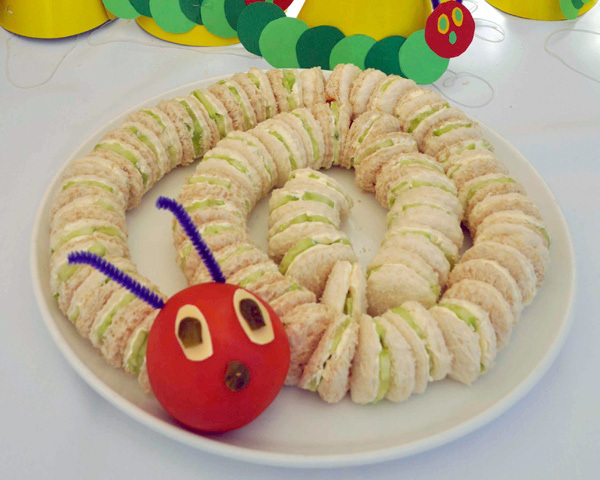 One of my favourite elements of this party, Roberta made the savoury centipede herself using cream cheese, thinly sliced cucumber and a round biscuit cutter, with a tomato, some cheese and sultanas for the head. So easy, but so dramatically eye-catching too! (I’m keeping this one up my sleeve to reproduce on a smaller scale to tempt my sometimes-fussy toddler.) 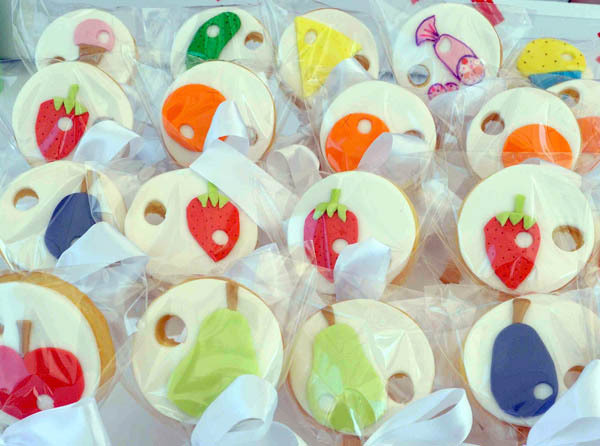 It jostled for space on the table with rainbow jellies, fruit wands, chocolate-dipped strawberries and macaroons. A children’s clothing designer with her own label, Roberta knows her way around a sewing machine and stitched together a massive bunting in spots and stripes to decorate the back garden of her Sydney home for the party. (In case you’re wondering how many hand-stitched flags it takes to fill the average garden, Roberta can tell you the answer is a hundred and fifty-eight!) Helium balloons tied to the backs of dainty vintage children’s chairs were the other decorative element.